In my hometown just south of the Frozen Tundra, Autumn made its presence known last week. I'm not okay with it accepting it in inches, and it got me thinking about the power of changing seasons in our novels. Hand-in-hand with the thematic expression of seasons is a more practical side. What does the change in weather mean for the reality of your book's action. Heavy snows or hard summer rains can delay battles or close roads, while autumn often means harvest time and festivals. Whatever the change of season means in your book, make the most of it. Use it to push the characters into action. What options don't they have in this new season that they did before? What new options emerge? Just like cold and weary troops have to fight differently in the winter, your characters have to think differently about how they'll travel and what they can access in each season. Do falling leaves obscure a much-needed path? Does a frozen pass or swollen river mean your MC can't cross for days or weeks? Or, maybe she CAN cross the ice to a region that's never been accessible before. That happened with Apostle Island sea caves on Lake Superior last winter because of the record cold. Seasonal change doesn't have to bring huge variations in your book. It's fun to play with the little things, too. How is the clothing different, the food, the customs? The list goes on. Get with the season and enjoy it! I realized it's been a while since I shared my reading list. 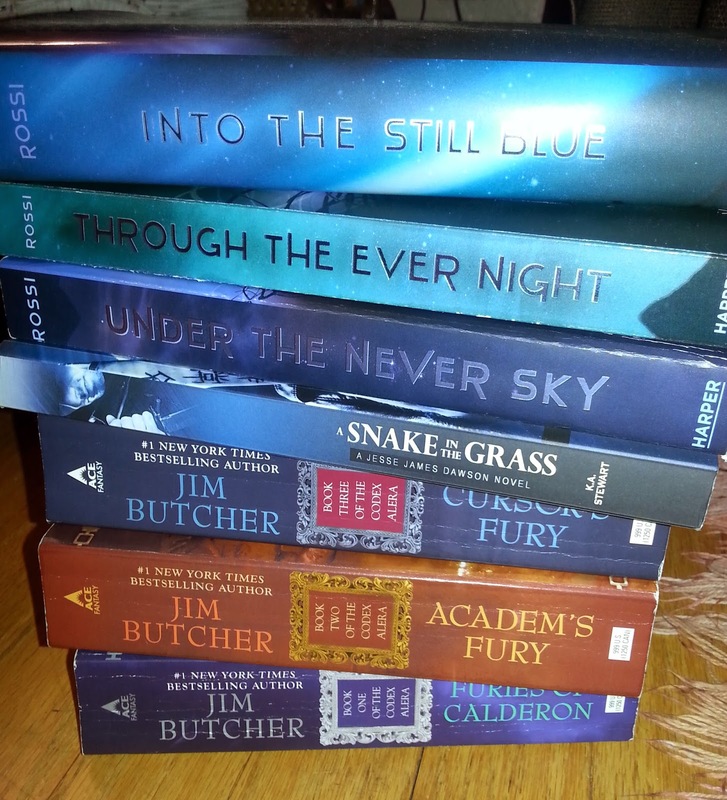 Lately, I've been gobbling up Veronica Rossi's UNDER THE NEVER SKY series and Jim Butcher's CODEX ALERA series, and THEY ARE BOTH SO FANTASTIC! The other book in the mix is K.A. Stewart's A Snake in the Grass, which I reviewed here. How about you? I never thought of uses the seasons to set the mood this way. Thanks so much. And I loved Veronica Rossi's series. Great uses of the seasons and ways to expand story elements. Seasons are definitely a great way to set the mood and create atmosphere. Usually my stories happen in the fall. I do wonder what that means! Choose the Advice Area You Need! Pick any of the carousel categories at left and browse posts on characters, worldbuilding, plotting, editing, marketing, encouragement, and more. Check out my new review site with Ashley Nixon! See my monthly posts at FF, plus a whole lot of other great SFF info! Copyright © 2016. Nicole Singer. Watermark theme. Powered by Blogger.